Research suggests the average family could save as much as $1,500 each year by purchasing generic products rather than brand name items. While some people are almost programmed to reach for the same big-name products week after week at the store, regardless of price, fathers should know there is a cheaper way to keep your family’s cupboards stocked with great products without breaking your budget. While everyone has their favorite grocery items that they refuse to switch, there are some items that are typically as good as their "real" counterparts when purchased generically. 1. Cereal. 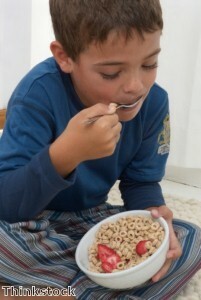 Store brand cereals are often just as good as other types and can be up to 50 percent less expensive. If your kids insist on the real thing, try getting into the habit of throwing the cereal box itself out and using reusable plastic containers instead. They may never know the difference! 2. Pantry staples such as flour, sugar, salt and spices are almost the same as the brand name versions. Yahoo Finance reports that the companies that produce these generic single-ingredient items are required to follow the same production and storage regulations as the brand name companies. 3. Medications. Both generic prescription and over-the-counter medications contain the same active ingredients as the brand name versions. They’re also regulated by the FDA. 4. Baby formula. All infant formulas sold in the U.S. must meet the same nutrient standards set by the FDA. Generic brands will save you money without compromising quality. 5. Fruits and vegetables. Choosing store brand produce may also help you save money and get a fresher, locally-grown product. Generic versions of other items, like snack products, cleaning items and beverages, may also be good investments. Start saving money soon by giving them a try!